In feudal Japan, women were generally seen less important than men. This meant there were not as many women as men in higher social classes. Furthermore, the degree of freedom women in feudal Japan had was typically low. For example, women, especially, of high classes in feudal Japan had no freedom of choosing who they marry, as these were typically the decisions of their families. The roles of women in this period greatly varied depending on which social class they belonged in. It was extremely rare for women to hold the emperor position in feudal Japan. However, there were two women achieved this position in the whole of feudal Japanese period. They were Empress Meisho and Empress Go-Sakuramachi, both in the Edo period. 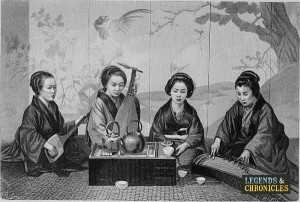 A group of geisha playing musical instruments. Samurai warriors were mainly men in feudal Japan. However, there were some female samurais and received the same fighting training as the rest. Samurai women were highly valued as they showed a strong level of loyalty and bravery. The husbands of those women were also typically warriors. One of the notable female samurai warrior is Tomoe Gozen who actually fought in Genpei War between 1180 and 1185. One thing to remember is that the roles of male and female samurais were significantly different. For example, samurai men were required to fight in battle, whereas this was quite a rare case for women samurais. The main role of samurai women were to protect the home and children when required. The roles included managing the servants, crops, food supplies, looking after children, as well as being responsible of the duty of revenge. Samurai women often carried weapons to defend themselves and their families. The most common weapon they had was a dagger, placed in their sleeves, which they could use to stab or throw. Another type of weapon, which was classed suitable for samurai women in feudal Japan was the naginata, which is a long poled sword, but not as heavy as the katana. As the geishas in Japan today, the main role and purpose of geisha women in feudal Japan was to entertain guests during meals and other occasions. The skills that geishas had in order to carry out their job included traditional Japanese dance, playing musical instruments and being able to speak to the guests who were mainly men. Geishas were highly respected for the skills they possessed and also for their wealth. There is also a term used for geishas who are young and are often still in the training process; maiko. 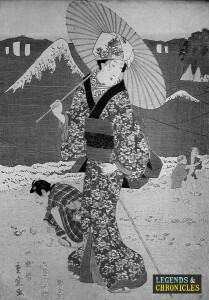 There were several unusual tasks that geishas and maikos were required to carry out in the feudal Japan period. They were, for instance, often used by daimyos to spy on other landlords and, moreover, to kill them. As this became a more common thing, people became wary of geishas entertaining them. The men often had security guards in the event of such suspicion. In some ways, low ranking women had more freedom than those in the higher classes. For instance, they were not forced into marriage, as the purpose was completely different to those in high classes. The purpose of marriage in upper classes were to create an alliance and put themselves in even higher classes. A geisha walking in town. As a general rule, the roles of lower class women in feudal Japan were to serve their husbands, before serving their fathers before marriage. Their jobs included serving wealthier families, looking after their children, looking after animals and crops, cooking for the families, cleaning and carrying out other household tasks. Wives of tradesmen were there to help their family businesses and the roles for these women greatly varied. Some women in the feudal Japanese period chose to take other roles including becoming nuns. In general women took more part in religious activities than men in feudal Japan. Poetry was another important thing in some women, especially those in the upper classes. Therefore, women becoming poets and literacy writers were also not uncommon during this period. As outlined in earlier sections, the level of freedom when it comes to marriage significantly differed between different social classes. However, one thing they all had in common was that they had no freedom to re-marry once they were widowed, unlike men in the period who had the freedom to do so. Furthermore, women could not request to be divorced. Because of this, feudal Japanese women often committed suicide to escape from marriage when they were not happy or were mistreated by their husbands.